Leave a comment on On sale now! You can now purchase Latino Muslims: Our Journeys to Islam. Details about the hardcover edition coming soon. My family went out for dinner to celebrate the book’s release. and their journeys to Islam! San Antonio, TX – January 11, 2018 – What drives Latinos to embrace Islam?Juan Galvan attempts to answer this question with the upcoming release of Latino Muslims: Our Journeys to Islam on January 15, 2018. This collection of heartfelt stories, explores the struggles, discoveries, and revelations of Latinos before and after their conversion to Islam. 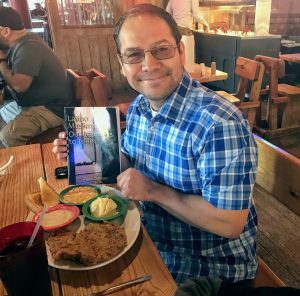 As a third generation, Mexican-American who converted to Islam in 2001, Juan Galvan certainly does not fit the Western stereotype of a Muslim. Following his conversion, he was asked by many why a Latino from the Texas Panhandle would embrace Islam. Challenged by his inability to readily answer this question, he embarked on a journey of self-reflection. This compilation of stories became his own personal search for answers. Juan is also the co-author of “Latino Muslims in the United States: Reversion, Politics, and Islamidad”, a 2017 report examining the identity of Latino Muslims in the United States based on the Latino Muslim Survey (LMS). 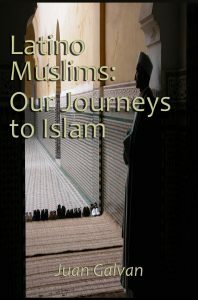 Latino Muslims: Our Journeys to Islam will be available at Amazon.com in paperback and digital versions and in hardcover at BarnesAndNoble.com. ISBN: 978-1530007349. Publisher: Self-published. Page Count: 243. 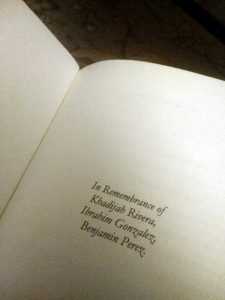 Visit LatinoMuslims.net for additional book details or to download a high-resolution book cover image. Juan Galvan lives in San Antonio, Texas, with his wife and three sons. Juan is a third-generation Mexican-American and the son of migrant workers. He is the third of eight children and spent his early years hoeing cotton in the rural Texas Panhandle. Juan encourages others to expand their views on the Latino and Muslim identity as he has learned through his own personal experiences. To schedule an interview or to receive a review copy, please contact Juan Galvan at juan.galvan@latinomuslims.net. “Here is a book that will fill your ears with a chorus of voices you may never have heard so clearly. What I love about this carefully introduced, large collection of testimonial essays is its variety, its unsettledness, its openness, its range. One the one hand, readers who know little about Islam and its history will be surprised by the very idea of Hispanic-rooted converts to Islam. They should get ready for some reminders: that Spanish is full of Arabic words, that the architectural resemblances between Mexico, say, and the Middle East are not accidental, that Spain, the social, cultural and intellectual pearl of medieval Europe, was full of Muslims from Mecca, Damascus, and Morocco for at least eight centuries, that large numbers of Roman Catholic and secular people now living in Spain and its far-flung New World ex-colonies may, if they like, trace their lines back to Muslim families of centuries ago— and that Jesus has always played an essential role in Islamic theology and Muslim life.